Legends exist in the past…until now. How inconvenient! The battle was won, but the war is not even close to being over. Lily, Sebastian, and Sir Kipling must travel to England in pursuit of Lily’s father as he seeks to discover a great evil and steal its power for himself. But her father isn’t the only one seeking that power. When a queen of the fae gets involved and Sebastian’s past comes back to haunt him, the three friends have to think fast and act faster to uncover Legends that are, unfortunately, no longer in the past. 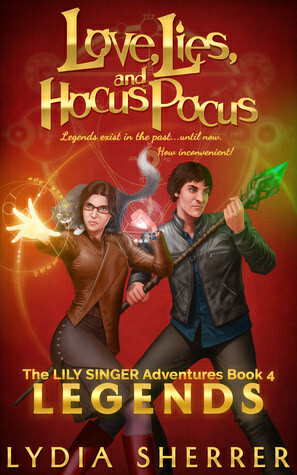 Legends is the fourth installment of the Lily Singer Adventures urban fantasy series. Full of unexpected twists and snarky humor, this story has been known to cause: loud snorts of laughter, inexplicable craving for tea, and loss of work productivity. If you enjoy magic-filled adventures like Harry Potter and Sabrina the Teenage Witch then you’ll love Lydia Sherrer’s delightful new series. This series is so good and this book was no exception. Although I am sad that now the wait starts for the next book in the series. Legends was filled with all the things I’ve come to expect from this series, great characters, awesome magic, the snarky cat Sir Kipling and a good solid story. It also brings something new to this series. In this book they travel to the UK and they get to visit the Fae realm! And there’s an exciting battle at the end and a bit of sadness as well. Some things get resolved, there are some interesting developments and at the end of the book I can’t help but be curious what the next book will bring. Throughout this series Lily is really growing into her own and she makes some important steps in that regard in this book as well. It’s really great to see her change a bit and stand up for what she believes in. She is not compromising on some of her points, like how she wants to be both fashionable and wear adventure clothes, which was a fun touch of showing her personality. She acts so realistic and I liked how she hesitated to harm others even though they probably deserved. On the topic of realism I was quite impressed by how the author wrote the battle scene towards the end, it all was over pretty quickly, but still you were able to follow what went on. It seemed realistic that battles with magic in this universe wouldn’t drag on for long as that’s basically not possible with the way magic works here. The change in setting in this book was interesting. Instead of in the familiar setting in the US and the city and locations we already know there, the story took place in the UK in this book. It was fun seeing Lily her excitement about visiting the UK and Oxford and I thought it was interesting how she noted the differences between the two countries. Although for me it just illustrated how different the US is as the UK is a lot more similar to the Netherlands. There is a bit of romance as a side plot line and I love seeing it develop and grow a bit in each book. The same is the case in this book and I liked were it left them at the end of this book and am curious to see it change even more in the next book. It was nice reading about both characters and how they slowly realize their feelings for the other. While the main part of the book is told from Lily’s point fo view, there’s an interlude in the middle from Sebastian’s point of view, which is always one of my favorite parts of the books. The reader meets some new characters and places in this book. There are some interesting new side characters, but mostly they serve to fill a bit of a role and they do play their part, but we don’t get to know them as much as I would’ve liked. I did like the manservant in this book. I didn’t really care for Yuki and her poking fun at Sir Kipling. I also didn’t really care for the plot line with a certain legend being real, but it didn’t diminish my enjoyment of the book. The main characters are still great to read about and we learn more about them in this book and Sir Kipling goes with them everywhere they go, so we see a lot more of the snarky cat, which was fun. I especially liked how we learned a bit more about the Fae realm in this book. It’s something the author only touched upon so far and in this book we get a nice chunk of information about the Fae. I still have a lot of questions and want to know more, but it was great to learn more about them here. I also really liked the scene where they visit the Fae realm. I loved how the realm was described, it looked so pretty in my head. To summarize: I really enjoyed this book! It’s just as good as the previous books and I liked how we get to read more about the characters I’ve grown fond of. The setting change was interesting too as they travel to the UK in this book. Lily develops more in this book again and I love seeing her grow into her own and finding her way. And she acts so realistically as well. The magic system is another thing that felt very realistic. Another part I really liked is how we learned more about the Fae and their realm in this book. And ofcourse seeing the romance develop was awesome too! I can’t wait for the next book in this series as these books are just so fun! Have you read a book as part of a series where one book took place in a different setting? The dreaded wait between releases. But that said, sounds like you got a good one before the wait. Love that she’s growing as the series progresses. Sir Kipling sounds great and neat that there is more Sebastian. It definitely was a good book before the wait. I was glad there was both more Sir Kipling and Sebastian as I like both of them a lot :). The move to a new setting was very itnerestign and I liked that part. I really liked the scene that took place in the fae realm. Every time I see one of these books, I think of you because I know how much you love them! And I’m glad you’re loving them 🙂 And ooh, the UK and the fae realm this time! Sounds fun 🙂 I’ll have to try the first book some day since I have it, but right now I’m a bit swamped with other books lol. That’s great you think of em when you see these books! It really is a great series. And I really liked the UK and Fae realm in this book. I am glad you got to grab the first when it was free and I hope you enjoy it when you get around to reading it :). You’ve been flying through this series. I’ve been really behind on commenting, but I know that I’ve seen several of these reviews. This series looks cute. The author released book 3 and 4 on the same day, so that’s why I read them so close together :). It’s a great series! I’m glad you enjoyed this one. I love when books are set in other countries – so that’s awesome you got to “visit” the UK with this one. Quite a lot of books are set in the US, so it’s fun to read a book set in another country :). I agree the cover art looks great! The author actually brands the first book as for fans of harry Potter I think, there are definitely some similarities between the two, but enough differences as well. I really like series because we get to really get to know the characters and keep seeing them in other books. That’s a big reason why I like series as well :). It’s great to read more books about the same characters. Sounds like it’s a great series and I love how you are getting to see the characters develop. The battle scene sounds really done too, I like that it was easy to picture it and also believe it. The character development in this series is so well done and I was really happy the battle scene was so well done and realistic. it’s great when you find a series in which you alike all books! The wait kills me though. When I read fantasy again I’m planning to read some fae books! Dragonfly @ Our Familiarium recently posted…Things I Should Have Known – A puffy cloud of perfection! The wait can be nasty, but luckily there are still a lot of other books to read :).